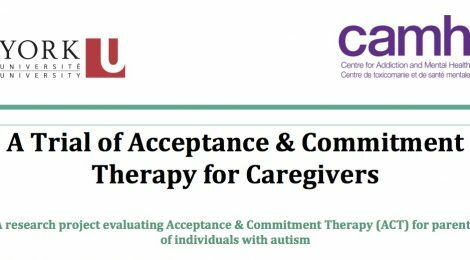 This is a research project evaluating the benefits of Acceptance & Commitment Therapy (ACT) for parents. ACT seeks to help individuals to struggle less with difficult things in their lives and mindfully connect with things that are most important in a way that is loving and respectful. With an introduction to the concept of “mindfulness”, ACT does not attempt to directly change or stop unwanted thoughts or feelings, but to develop a new mindful relationship with those experiences that can free a person up to being open, and to take action consistent with what they care about. Each workshop is facilitate by a parent of an individual with autism and a trained clinician. Mothers and fathers of children, youth or adults with autism. Fluency in English is required. Sessions 1 and 2 occur on consecutive days. Session 3 is four weeks later. As a participant, you will need to attend all three sessions and complete some questionnaires before the workshop, and again three times after that. Participation in the workshop is free. Download the study flyer, here. The study is supported by the York Research Chair in Autism and Neurodevelopmental Disability.